You have a choice when it comes to how you process payments. How you process a credit card in today's advanced world of payment technology is more of the question, versus if you accept credit cards. In every area, universally, people appreciate convenience. 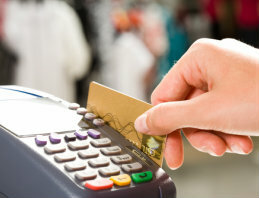 Provide the ultimate convenience and gain the respect (and cashflow) of your customers with Merchant Card services. Peoples National Bank has partnered with a recognized leader in the payment processing industry. We are committed to providing sophisticated technology, competitive pricing, and best-in-class service for all your merchant service needs. Accept payments anytime and anywhere, contact your local bank representative to get started.